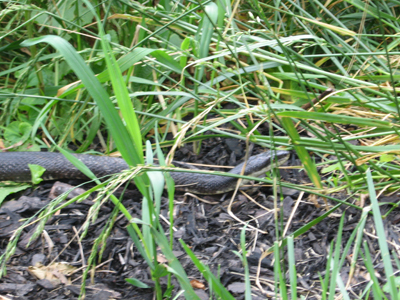 On Thursday, Eldest reported seeing the tail of a black racer up in the garden shed. The tail was in the back of the shed, amongst the flowers pots, and…the deer netting. As the tail moved energetically, she made a hasty exit. Saturday morning, I went into the shed, and saw a tail of a black racer, and realized to my horror that it was in the same location as Eldest had reported. It must be the same snake and it must be trapped. I nudged it with my foot, and it moved a bit. It was still alive. I raced into the house, called to Husband to help, and we both grabbed our garden gloves, a pair of scissors and flew back up to the shed. The snake was tangled in a roll of deer netting, the light-weight plastic kind. As we gently moved the tangled roll closer to allow us to rescue the snake we saw to our tremendous dismay that a second snake had been similarly snared and was dead, and a third snake, also alive, was trapped as well. We worked together to carefully snip the netting away from the first snake, starting from the farthest point from the head, to prevent the snake from struggling or biting while we worked to free it. We needn’t have worried. The two snakes were exhausted and barely moved as we worked. At last the first snake was free, and Husband released it into the weeds and periwinkle on the hillside by the shed. The snake moved off fairly well and disappeared. 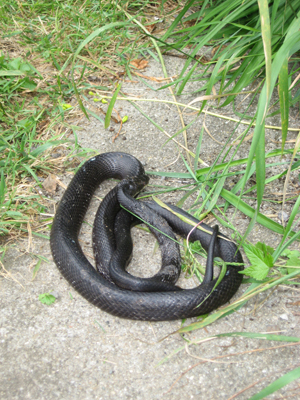 The second snake was much larger and in much worse shape. When it was finally released, it moved a bit, but then stopped to rest, still very much in sight. Both snakes were easily over 5 feet long. You will forgive us for not photographing this event for the blog. We were concentrating only on snipping each strand of plastic, to release the snakes as quickly as possible. We then bagged and removed the dead snake along with the netting. Not much of a funeral — in fact, I disposed of it quickly and unceremoniously, because I wanted instead to clean out the back of the shed. Happily there were no more snakes. We did find a plastic gallon flower pot, filled with shredded burlap and bits of cloth: a mouse’s nest, and clearly the attractant for the black racers. I felt terrible. While the netting was rolled up in the shed, it wasn’t put away properly. It should have been in a bag of some sort, for tidiness if not for snake-safety. I felt my Puritan ancestors’ enormous disapproval. If I were tidy (and probably thrifty, clean, obedient, and chaste) this would not have happened, and those beautiful snakes would not have suffered. We walked back to the house, hoping that the two snakes would recover. Before we left the hillside, I sprayed a bit of water from the hose over the area, hoping to give them a drink of water which I suspected they needed desperately. We sat on the front porch, talking over the event, when MacKenzie began to bark. MacKenzie rarely barks. 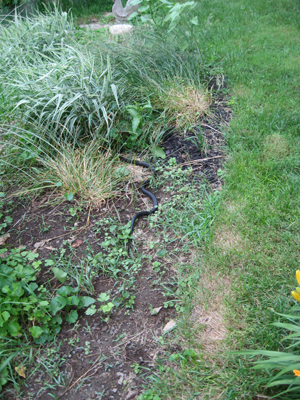 I left the porch, and found her barking into the stella d’oro flowers at yet another black racer. I called her off, but she lunged in, grabbed the snake behind the head and lifted it off the ground. When I called her off, she did drop it, and then came to me. We hurried her into the house and shut her in, and then turned back to the snake. It remained as she had dropped it. Its head rests near the top of the photo. MacKenzie's mouth marks show as lighter areas on its body. Despite having no rattle, the tip of its tail was nevertheless vibrating vigorously. I hoped that was a good sign that it was not too badly injured; however, the snake remained in that coiled and very open location for minutes. Finally, it stretched out and headed for the decorative grasses of our slope garden. Its head has already disappeared into the grass. This may give you a better idea of its length. And so I returned to the front porch for the second time that day, to recover again from a close encounter with our usually invisible neighbors. 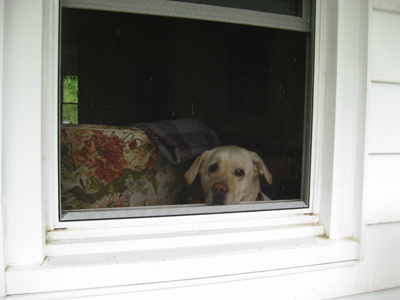 MacKenzie, banished indoors, was confused and unhappy. Her feelings were dreadfully hurt. 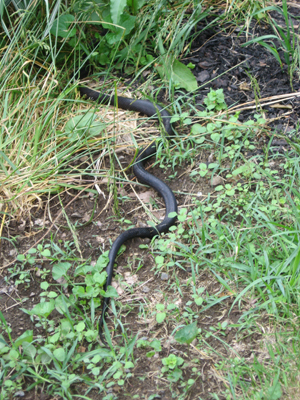 That final snake was last seen moving through the grassy lawn, heading up to the hillside. At my dad’s suggestion, I left two eggs where the first two snakes were released, hoping to provide them a healing meal that didn’t require too much energy to eat. My lesson is learned: Tidy is safer than not tidy. We wish the snakes well, and the selfish and emotionally exhausted part of me wishes heartily to never spend a morning like this again. What a wonderful story. I’m glad you guys were able to save these good snakes, and I don’t think you should beat yourself up too much about the circumstances…. My favorite part of your tale is Mackenzie’s little face and your caption: “Her feelings were dreadfully hurt.” I wonder why there were so many snakes together? I always think of them as kind of loners. Is that wrong? I think there were so many snakes because we have a bountiful food supply. As you know, we are overrun with chipmunks, and the mice found the garden shed very much to their liking. Burlap sacks for handy nesting material, and birdseed stored in metal cans that they were somehow able to access. I also found small holes nibbled in the tops of unopened bags of potting soil, with neatly emptied acorns within. I guess the mice enjoyed bringing their dinner inside to dine. But the snakes realized this bonanza and hunted in the shed. I left out two eggs for the snakes last night, hoping to provide an easy meal for them, and both were eaten — only the shells remained, and no evidence of whites or yolks. Of course, it could have been any number of things that ate them, but I do hope it was the black racers! I know. When I shared our story with my dad, he said that in his day (he was born in 1925), people used to dispatch a snake with a hoe without a second thought. Killing a snake in your garden was what everyone did. Appalling. I rescued a fourth snake last Saturday. I thought I’d removed all of that treacherous light-weight netting from our shed, but this younger snake (assuming that shorter snake = younger snake) found it and got tangled. I found him early, thank goodness for him, but not so good for me, because he was still energetic and VERY annoyed. I was alone, and carefully lowered a flowerpot saucer over his head so that I could free him safely, but he still managed to wiggle free 4 times and strike at me. He missed. I cut him loose and backed off. He left the shed shortly thereafter. I am very interested in your pets and will look up milk snakes (same thing as a corn snake? I guess I’ll find out!) and a California king snake! Very ineresting, and thanks for sharing! Hi Amy, I found your blog by chance. You amaze me with your compassion for the snakes. Most people (like me!!) would just run off far far away. There was a snake a couple of weeks ago at my backyard and I’m terrified! I’m praying and hoping it (or any of its other relatives and friends!) will not come back forever. Eeeks!! Hi! Lots of folks feel this way — snakes are so rarely seen that it is hard to get used to them when they do make an infrequent appearance. I think we’re calmer around the things we’re most familiar with. An unexpected snake is startling, to be sure! Please know that while I do have compassion for them, I don’t seek them out! I’m happy to be “good neighbors” with them — the idea of a fence, and all. I’m grateful they go after the chipmunks and mice, and I hope they’re grateful to me that I don’t go after them with a weapon. They were actually pretty, with the sun on their black backs and their creamy white chins. But best appreciated from a healthy distance!